"My Momma Always Said: Life Is Like a Box of Chocolates..."
Forrest Gump: "I'm not a smart man... but I know what love is". Because if you really look at it, these special people are not idiots...They may behave differently and communicate differently, but hell, they are not idiots who go about crying, screaming, making messes everywhere, and creating havoc! And worse, these special people are not all mentally mad, who talk to themselves and laugh hysterically and pull their hair! Each special condition has a different way of presenting themselves...How can it be that all the special people portrayed had the same way of behaving (terribly)? Just last week, my mother and I saw a young lady with Down Syndrome shopping in the mall...alone! She was properly dressed and she went about on her own, and never made a nuisance! As for mentally slow/retarded, it does not equate embarrassment, idiot or nuisance! And for Cerebral Palsy, well, they aren't pain-in-the-necks either...Chee Keong had CP, and he was terrily spastic on the limbs, with a whole host of other problems, and was mentally slower than children his age...But he could communicate his likes/dislikes, and he could understand instructions...And he was very lovable! But, they aren't pain-in-the-butts like those portrayed...They are not a hybrid of Aznil Nawawi+Jim Carrey+Eddie Murphy gone horribly wrong! i actually saw a short show last night where there was a cacat boy and he was annoying. all he did was scream and act stupid. you're right. cant be that all cacat people are like that. hmm.. riding the bus with my sister..
it was a really nice show.. touching and everything.. I think I watched it at least 5 times..
What you want for Christmas? First time here. Interested piece you have posted here. Good work! I agree with you. I am with you in this matter. I mean, come on! All people are born to the world with a role. Some with certain disabilities, but somehow possesses things we wont understand, we won't be able to do. Who irritates you more? Mat Rempit yang sihat walafiat biking like crazy in the pit dark of the night looking forward to get earlier into the grave or the disabled? In my case, the disabled is never irritating. We need to change this. just curious, which shows were you refering to? i may have missed it completely or i would say my piece too. another famous quote by mr Gump- 'Stupid is as stupid does'. now, to have this silly idea that DS kids are bunch of idiots as being portrayed in shows are totally uncalled for. i mean, them actors dont need to try hard as they look like a bunch of retards themselves. ok, that was unnecessary but like the directors, i can make things up too. That show was indeed beautiful...Rosie O' Donnell was actually very lovable! Exactly...We have 'normal' people who go all out to annoy the general population and what do we do? We go and glorify them by giving them free this and free that, and even award them with a trip to the poles of the world, and give them tokens like skydiving! Although the last 3 ones, I tengok, got disgusted and flipped somewhere else...Why give them the movies the honour and patronage by actually watching then? yeaa...tell it to me over some coffee. i am so looking forward to you-know-what...!! Daphne, maybe u shud write to the director/producer/wht-not abt it? im not sure abt msian dramas/movies but iv watched The Other Sister (Juliette Lewis) and I am Sam (Sean Penn and Dakota Fanning)a few times esp I am Sam and i kid u not tht everytime i watch tht movie, id cry my eyes out! Most Malaysians haven't got over the stereo-typing of certain groups of people. And that include directors. Maybe some of our more thoughtful directors will some day come up with a movie like Forrest Gump, or I am Sam. We can only hope. I have great respect for Yasmin Ahmad and I hope some day she will tackle this issue of stereo typing of people not considered "normal" by society like she tackled religious, and racial issues/relationships in her previous movies. You know what, the idiots are not the special people. The idiots are normal people who make fun of disabled people. The idiots are some Members of Parliament (i think you know who) who do not know the feelings of special people. The idiots are the general public who patronise special people. Now we know who the real idiots are. i agree that when actress/actor gets a role, they do hv to do their "homework" before protraying a certain role..movies directors do hv a responsibility to 'educating' their audience. Movies such as "forest Gump", "I am Sam" (Sean Penn), "A beautiful mind" (Russell Crowe)are some great movies that showed me the different side of people who are unique..
u hv a great xmas daphne and a wonderful 2008! Great post...ya, ppl should not make fun of others because they are not 'normal'. But seriously what is 'normal' in this day and age ? What I wanted to say has already been mentioned by most of your readers here. When one is ignorant of a special needs person's situation, one appears more idiotic when one tries to portray that special individual. Stereotyping is the worst thing an actor can do ... at least I think so. AHHHH forrest gump,my all time favourite.i mean it may come across as absurd how he pratically influence the whole of USA in the 60's and 70's.jokes aside, that sort of sincerity is magnetic. 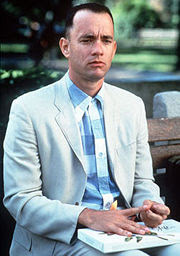 Forrest Gump is my one of my favourite movies. The out of ordinary achieved by the not-so-ordinary. It's the label of "not so ordinary" like kurang upaya that I don't quite agree with. As if those fully 'equipped' with limbs and all nerves and neurons functioning ordinarily are really full of keupayaan? I think not. It's high time that local film producers give much thoughts to the character they want to cast in their films, beyond just the money behind it. Very interesting point you have over there but you must remember one thing who is the real disabled person here. People who swallow up shows like these and agree with it thinking that this is an accurate portrayal of reality. Dont blame the misinformer. Blame the misinformed. Until we can get people to go out and see it themselves, we will always have ignorance. And I agree about your comment about Downsyndrome childre. I met a 28 year old DownSyndrome person (he is small so I thought of him as a kid) and I entered a very deep conversation with him which delighted me. Moreso than many fellow people that I know who thinks the world revolves around celebrities. If you ask me I know who's the disabled person here. I realize I'm sounding very bitter but I'm just very bitter. How do you love a mass? wonder whether u watch 'the simple life of Ah Wong' the HK version of Forrest Gump over on tv2 from 7 to 8pm on weekdays?pretty cool .i laugh my arse off.for this whole month all appointment is off from 7 to 8. Spot on, Girl! These special children or people are the group that need protections and special rights in our society. Not the rich selected businessmen or contacts. Malaysia do not have enough speech therapists, child physcologist, etc. We have too many "idiots" who claim to champion the rights of certain group. Yes,somehow local programmes will 99% show that OKUs are a hysterical,idiotic,manic or psychotic lot.And you'll see the actors are actually more kurang upaya then the OKUs. I would say the actiors are more like OKA(orang kurang akal). I think the problem lies with research, or actually a no research by the scriptwriter or screen writer or the director. And for Malaysian actors to do research on their character?? And I am sure many malaysian knew that the potrayal is for from right and nbody believes that the OKUs are like what had been acted. But its unfortunate that these stereotyping of OKUs in local drama is here to stay., esp for hari raya fare, a telemovie with OKU tearjerkers is a sure hit. Forest Gump and I am Sam had shown us, OKU can be good on movies. I think that is the way so called normal people like us try to cope with all these deficits in life because in actual fact, many of us do not know what to do in the presence of the handicapped. Once a certain professor asked what is so emas about orang emas meaning old people ? If we are to be truthful with God and with ourselves, then we should know that if these deficits are normal, then they should be like us. We don't have to construct any extra things for them. But you see, we cannot. We have to make special walkways for them. We have to give them the white cane. We have to give way to them. Yes. It sounds selfish. But that is the real exact meaning of " handicapped ". Handicapped means one cannot do what so called normal people can do. It is not that they cannot do. It is that they do not have all the functional natural abilities for them to do so. Probably at the end of the day, it is making the best out of a bad situation. If the person is blind, is that the end of the world for him ? No. Definitely not. But he cannot be like the so called normal people because in a fast paced world, without a pair of eyes, you really cannot compete like all the other so called normal people. Even normal people are competing with normal people. Normal people suppress normal people. So how much is the fighting chance for a handicapped person ? Handicapped people are here for one of the many purposes and that is to teach the normal people, love. You have a wonderful Christmas and a Happy 2008 too! How many of us are so-called 'normal'? I'm not! Oh dear! I can tell you that children with DS are amazing around water! You will terbeliak when you see them! They are so amazingly flexible that they will keep everyone amazed with their antics in the water, and you will actually envy them! If only the child had gotten to go in! What a treat you and him would be in! You know, you have a way with words...You have actually summed up everything that has been said here in just a few lines! You know, you are right! People with DS don't hold grudges! I was talking to a friend of mine who's DS brother died at the age of 50+ (he fell and hit his head), and he said that if there's one thing he remembers about his brother, it is that he doesn't know how to hate! Come to think of it, who is the OKU here? Good point! We're all 'fully equiped' but we all have our shortcomings too! All you need to do is to go to the Hospital's Medical Social Work Department and see the officer there, fill in a form, get interviewed (by the officer) and get your tag! But I think both sides have to be bear the blame...The misinformer has a responsibility on the public, and the misinformed has a responsibility to him/herself! And no ler, Kevin dear, you don't sound bitter...Nothing bitter at all! Great to hear from you, by the way...Take care, and keep in touch! No, I haven't seen the show...I didn't even know there was such a show! Haha...Cute nick! And come to think of it, might not be such a bad idea, after all! You always come up with great comments Doc...They are sometimes like a post on its own! As for tearjerkers, it doesn't have to be so...Making movies shouldn't be just about the money or the publicity or the ratings! And yes, these special people teach us love...They really do! This is my 1st time drop into ur blog. Ur articles about OKU (DS) in Malaysia really going-in-deep in heart especially I had spent few years with them in OKU Special Class in Taiping. Beside that 2 movies ur mentioned, u should have Rain Man dan Forest Cat (Fei Mau), Hong Kong Tv Series (early 2000). Last Sunday Mingguan Malaysia and Monday Berita Harian also highlighted this issue.